Search for open CNS positions, including long and short buy-in positions. View the CNS cash balance for your participant account. Add, edit, delete, and search for existing fully-paid-for, exemption, and priority instructions. List all the reports that are used to complete and balance daily settlements. Explain each report, its function, and how it relates to each step in the settlement process. Explain how the netting process works. Explain the importance of the Consolidated Trade Summary (CTS). Explain a one-day settling trade. Distinguish between CNS and Non-CNS transactions. Explain the importance of the Miscellaneous Activity report. Understand the importance of the Preliminary and Final Cash Reconciliation Statements and the Daytime and Nighttime Settlement Activity Reports. Understand the importance of the Final Settlement Statement and the Accounting Summary. Members should refer to the Rules and Procedures of NSCC and other applicable parties for the legal obligations of all parties concerned. This guide is not intended to serve as a legal document. All brokerage firms and member numbers are fictional and used for illustration only. No statement in this content should be construed as a legally binding rule or regulation, or as creating an obligation on the part of NSCC or any person. View CNS Overview webcasts to gain a great of CNS and continuous net settlements at DTCC. Access CNS Documents to view CNS User Guides and CNS Acillary Services FAQ. CNS ACATS DTC explains the ACATS settlement process for CNS and DTC eligible assets. 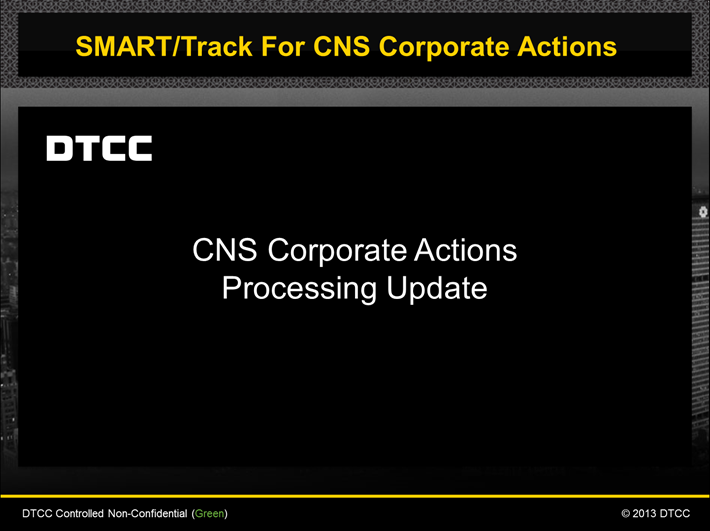 View CNS Corporate Actions to learn about the CNS SMART/Track initiative. Log in to view CNS content in this Learning Center. 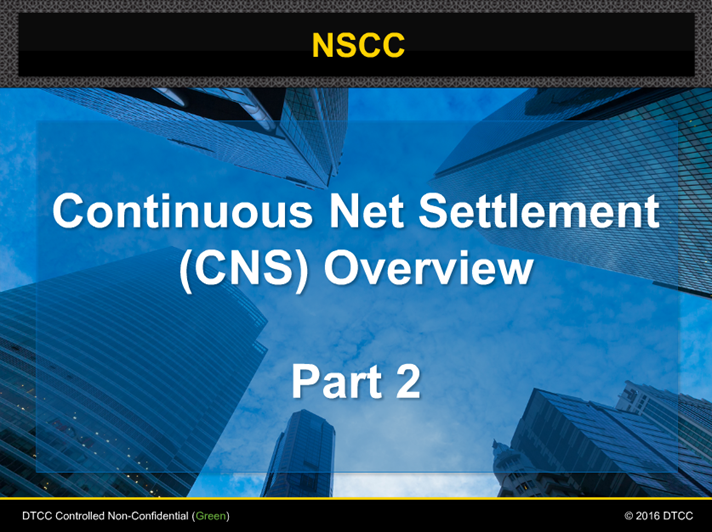 This is an interactive 15-minute overview of Continuous Net Settlement, Part 2 of 2. This is an interactive 15-minute overview of Continuous Net Settlement, Part 1 of 2. To access Fully Paid For Accounts, you need to be able to access DTCC’s Customer portal. If you do not have access, contact your access coordinator and request access to the portal and under available products, “CNS”. After accessing the portal, click CNS from the Available Production Products. What Is The Fully Paid For Account? The Fully Paid For Account is a special subaccount within NSCC's Continuous Net Settlement (CNS) System that assists participants in maintaining compliance with possession and control requirements pursuant to Rule 15(c)3-3 of the Securities Exchange Act. The Fully Paid For Account allows participants to complete settlement obligations based on anticipated same-issue allocations from CNS. Third-party deliveries for credit through the Institutional Delivery system are facilitated by this CNS subaccount. The Fully Paid For Account is available for CNS-eligible equities, corporate bonds, unit investment trusts, rights, and warrants. Who Can Use The Fully Paid For Account Service? The Fully Paid For Account is available to all NSCC full-settling members and especially benefits those that serve both retail and institutional client bases. What Are The Advantages To Using The Fully Paid For Account? Doesn't force you to arrange for "iffy" borrows or to wait for expected allocations and separately process third-party deliveries. Expedites and synchronizes street- and customer-side settlement, facilitating cash-flow planning, and reducing interest and carrying costs. Enhances and maintains the protection of your customer securities. How Does The Fully Paid For Account Work? Brokers who are expecting a receive in CNS of a security may make deliveries of customer securities to third parties. If CNS does not allocate the position, the member may convert the right to receive for value into a right to receive for free. To move positions in and out of these accounts, participants submit instructions to NSCC by mid-morning. On the money settlement side of the Fully Paid For Account, NSCC debits the participants' money settlement accounts for the current market value of long securities positions moved into the Fully Paid For Account. These debits are accounted for separately. Thereafter, participants' daily net money settlements are adjusted to reflect price changes through daily marks to the market, until CNS security allocations offset positions in participants' Fully Paid For Accounts. Are the ACATS settlement process changes optional? No. The changes associated with the new ACATS settlement process are not optional. If your firm is an ACATS participating broker-dealer, you will have to make these changes. See also: CNS ACATS DTC.